I was blessed with free-spirited parents that encouraged me to let my true colors blossom. Today, I seek to nurture this liberty of self-expression in my own kids. My two wildflowers are very much their own ladies; the youngest has a bubbling enthusiasm for art while the eldest soars across the soccer field with dazzling eyes. They both share a curiosity for fantasy creatures and a love of playgrounds. As a mother, I am so eager to be present as they continue to grow into themselves. As parents, we want to create an environment that fosters independence and self-expression. As infants, your children will need you to care for their livelihood. As they grow, they'll reach out into the world, exploring on their own. While they will still rely on us for love and support, they'll need to find their footing and develop an independent rhythm. How can we ensure their health and happiness without stifling their journey into adulthood? It's a tricky compromise, but I have some ideas on where to begin. 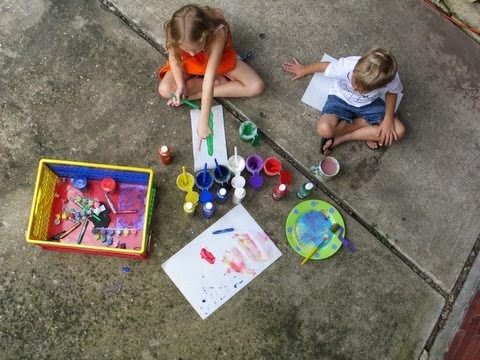 Here are nine ways to encourage independence and self-expression in your children. Let them play: This is simple and sweet; give your kids freedom to play. I cannot celebrate enough just how wonderful play is for all aspects of children's growth! Through solo play and group play, they'll discover their talents, hobbies, and communication styles. Play can also bolster essential motor skills so that they can spread their wings and explore. Distribute chores: By cleaning up, kids can gain self-reliance. When they'll able, give them a chance to wash the dishes or fold their own laundry. The trust you place in them will reassure them that they can get the job done. This builds accountability and respect for themselves. Don't just read to them: Reading to our children is deeply rewarding, especially if it's a mutual exchange. Ask them how it makes them feel. Do they agree with the actions of the protagonist? What would they have done in that situation? This gently urges them to think for themselves. Offer guidance: When a decision arises, offer guidance and support to them while handing them the proverbial keys. They'll navigate the cause and effect of their own actions while feeling empowered by your trust. Growing an internal driving force is essential to healthy independence throughout life. Compliment their actions: When your children do something awesome, express your pride about the positive details of their actions. Focus on the how and why of their success. This celebrates their unique efforts; they achieved a goal in their own way. Be a good example: We should never underestimate the influence we have on our kids. To nurture a free spirit in your children, take care of yourself, take pride in your endearing quirks, enjoy hobbies and be fearlessly you. Confidence is no easy feat, so take this to heart; as parents, we can grow and discover ourselves along with our children. Don't allow labels: Ban labels from your family's life. Inform them that a label could never capture all the facets of an individual. Labels are limits; invite your kids to soar past them in the dance of growth and learning. Show them that, no matter what, they are who they are and that's a gift to the world. After all, it takes a medley of unique instruments to make the music that delights us! Express, don't hide, feelings: Stress to your children that they should never bottle up their feelings. They should be aware of how vital it is to be able to speak openly about their feelings and how much it can help. I always let my girls know that emotions are nothing to be ashamed of; I let them see me crying or stressed and I also share with them my joy. Get artistic: Art! What better way to indulge in self-expression? There is a dazzling array of art forms to try, such as painting, drawing, singing, or dancing. Your children can truly express themselves in ways they never thought possible. Not only that, art is fun and therapeutic. What ways are you nurturing a free spirit and independent thinking in your children? We'd love to hear from you! Kids still need to get outside and play using their own imagination. Getting active and physical is good on so many levels. It never gets old. Good points here, Kim! I really like the point about banning labels. We really can do without them, but peer pressure sometimes brings them back into children's lives.